Definition at line 2611 of file mesh.c. Definition at line 2619 of file mesh.c. Referenced by D3DXLoadSkinMeshFromXof(), parse_mesh(), parse_normals(), parse_skin_mesh_info(), parse_texture_coords(), and parse_vertex_colors(). Definition at line 2617 of file mesh.c. Referenced by D3DXLoadSkinMeshFromXof(), and parse_mesh(). Definition at line 2633 of file mesh.c. 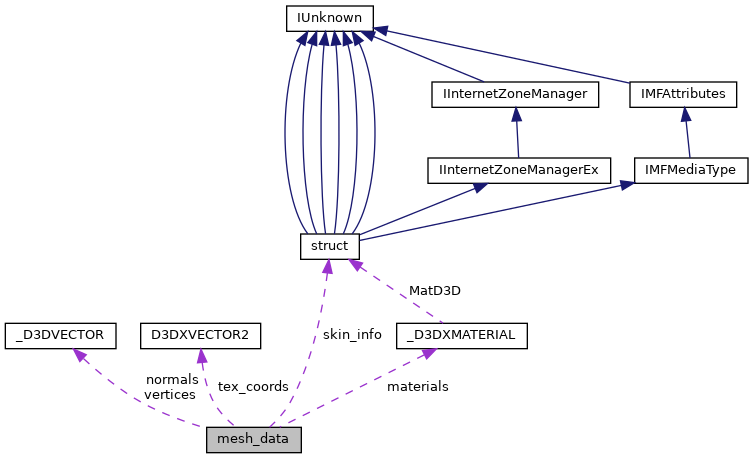 Referenced by D3DXLoadSkinMeshFromXof(), destroy_materials(), and parse_material_list(). Definition at line 2632 of file mesh.c. Definition at line 2636 of file mesh.c. Referenced by parse_mesh(), and parse_skin_mesh_info(). Definition at line 2625 of file mesh.c. Referenced by D3DXLoadSkinMeshFromXof(), and parse_normals(). Definition at line 2624 of file mesh.c. Definition at line 2631 of file mesh.c. Definition at line 2623 of file mesh.c. Definition at line 2613 of file mesh.c. Referenced by D3DXLoadSkinMeshFromXof(), parse_material_list(), parse_mesh(), and parse_normals(). Definition at line 2614 of file mesh.c. Referenced by D3DXLoadSkinMeshFromXof(), parse_mesh(), and parse_normals(). Definition at line 2616 of file mesh.c. Definition at line 2612 of file mesh.c. Referenced by D3DXLoadSkinMeshFromXof(), parse_mesh(), parse_skin_mesh_info(), parse_texture_coords(), and parse_vertex_colors(). Definition at line 2635 of file mesh.c. Referenced by D3DXLoadSkinMeshFromXof(), parse_mesh(), and parse_skin_mesh_info(). Definition at line 2627 of file mesh.c. Referenced by D3DXLoadSkinMeshFromXof(), and parse_texture_coords(). Definition at line 2629 of file mesh.c. Referenced by D3DXLoadSkinMeshFromXof(), and parse_vertex_colors(). Definition at line 2615 of file mesh.c.